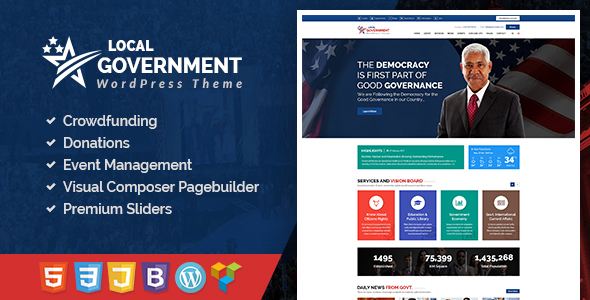 Local Government – WordPress Theme is a theme designed for local governing bodies, town and municipality websites and similar sites who are looking for the great design for their online assistance to the general public. With Local Government WordPress Theme, you will get all the features you need to showcase your campaigns. This WordPress theme possess great features including 3 News pages, 2 contact us, Donation page, event listings, event detail page, and multiple causes pages. The theme is highly responsive whcih makes it compatible with all modern devices. It is a niche specific design with a dynamic functionality.